It's always a joy to watch them make believe, and copying the things they have seen going on in the real kitchen. 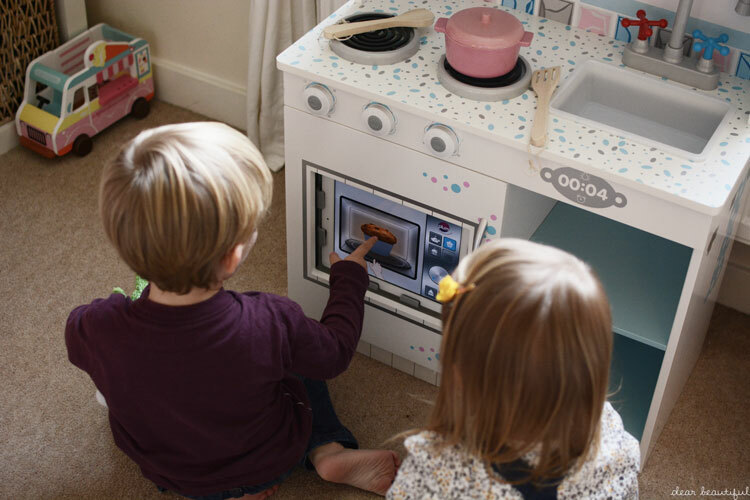 They identify foods, colours, count, and talk lots while they are doing it, so I think a kitchen makes a fantastic fun and extremely educational toy. I'm sure I can't be the only one who's attention turns to Christmas presents at this time of year. Planning the 'big present' for the kids is always the first one I think about, and then a few other presents might spin off from there. And I know that play kitchens are always a popular present choice for preschoolers. 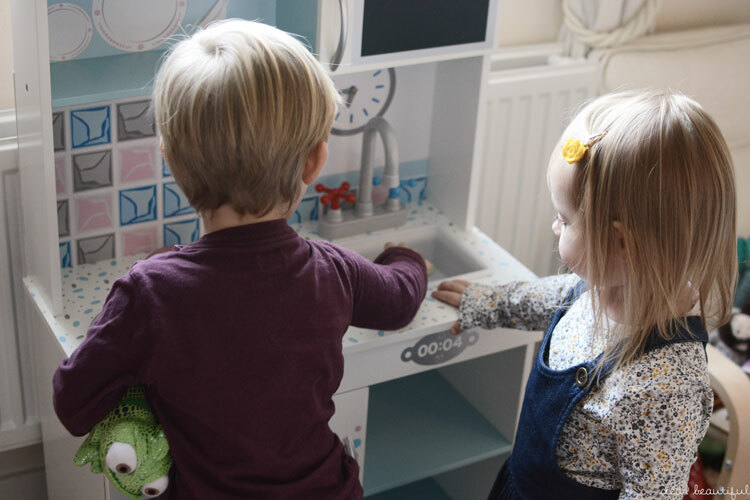 We had this cracking little kitchen called the Snowdrop Interactive Wooden Play Kitchen from Plum to test out, and the kids really enjoyed putting it through it's paces. It took quite a while to build, but the directions were really clear, and it's a complete showstopper once it's built. It comes with a few little accessories too, which I think is a nice touch; including cooking pots and utensils. 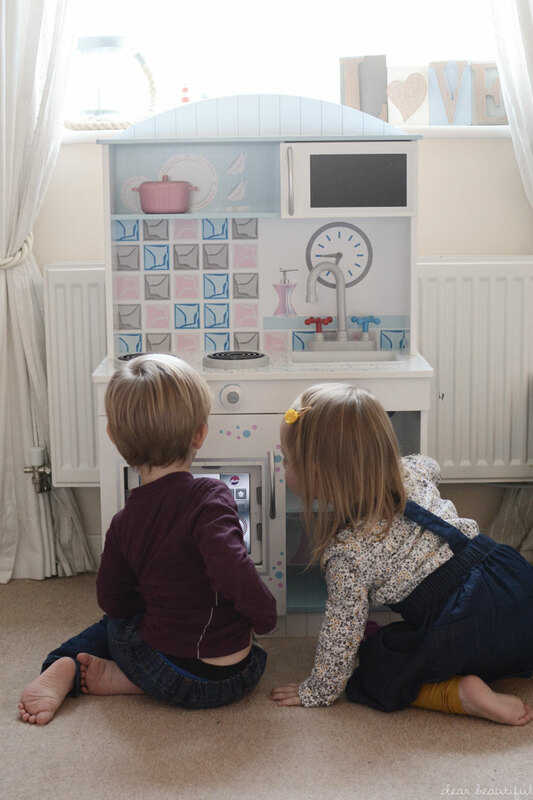 But the real show piece of this kitchen, is that it has a cupboard which allows you to fit in a tablet (in our case an iPad) so that you can make the kitchen really interactive. You can download an app which turns the iPad into a microwave and allows the children to cook popcorn, cupcakes and chicken to their hearts content. 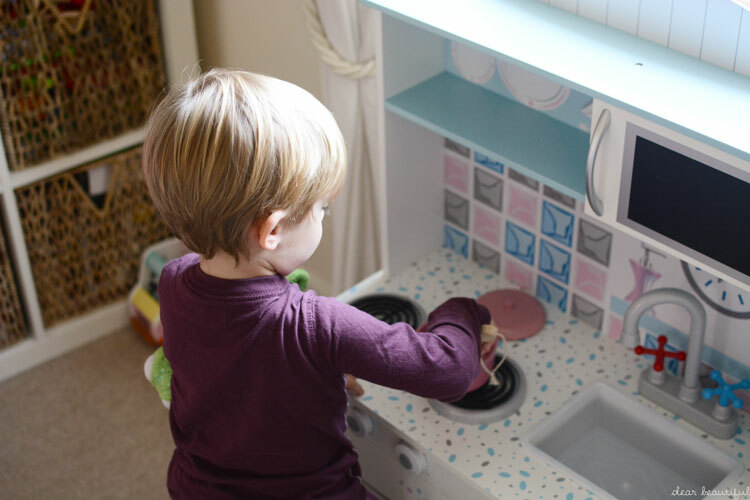 While I do love the make believe element of 'playing kitchens' it's really lovely that the app allows them to feel like they are really cooking something, and it proved very popular with my two. We were sent this kitchen to review, but this doesn't affect our opinion of it. All words are honest, and my children really have enjoyed playing with it. I love the interactive aspect to this....kind of makes me want to try and adapt the Ikea one so we can do something similar! Ahh you two are so cute doing their little role plays. What a fab kitchen! ;) Love the review. I love that it's interactive too. Something this day in age is great for the tots. Lovely photos as always. 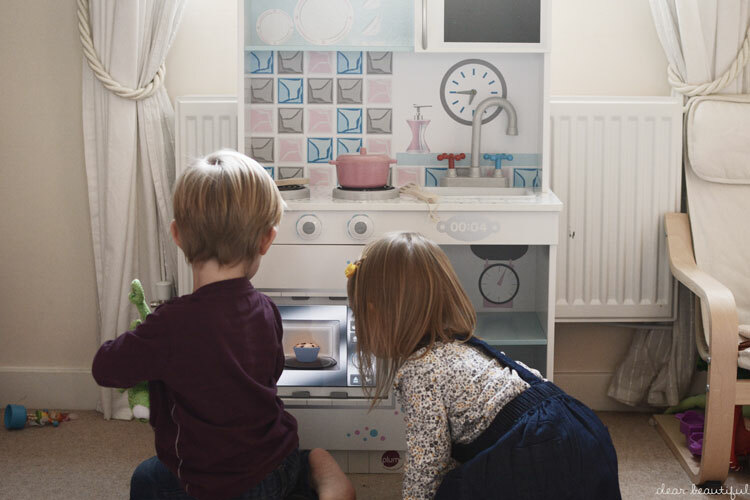 Aww they look like they're having a whale of a time - I think our play kitchen was one of our best ever buys too - there doesn't seem a day goes by that it isn't being used for something - lots of birthday cakes in our case! !